Bonsai Brewing Project is located at 549 Wisconsin Ave in Whitefish, Montana just after the viaduct and on the way to Whitefish Mountain Resort. Graham Hart and Keela Smith are the owners. Graham is the brewmaster and Keela the general manager. The atmosphere of the brewery both inside and out is very inviting and full of creativeness. From the art pieces to the utilization of space and all the way to the inspired beer and food the one word that best describes Bonsai Brewing Project for me is, creative. Outside you will find an old fermenter that has been converted into a wood fired warming stove for the colder months. In the warmer months their enclosed outdoor area is dotted with patio furniture where patrons can enjoy their brews in the great outdoors and it is large enough to give a well behaved Fido and/or supervised kids a nice area to roam and play. There is even a designated smoking area if you desire to smoke one of your fine cigars while at the brewery. Inside you will find a lot of wood and dark colors that are contrasted by stainless steel and vibrant colors. 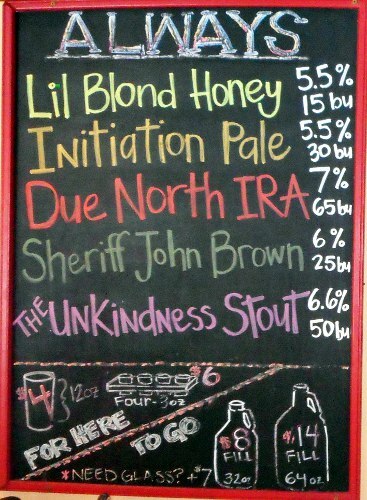 One such example is their black chalk boards with the beer lineups written in neon and white colors. The color balance and layout of the entire brewery is very eye appealing and inviting. Some of the tables even double as barrel storage racks. The barrels are used for aging beer and the tables/barrel-racks help utilize space efficiently in addition to adding character of the taproom area. Attention to detail is demonstrated by features such as the strategically placed sound deadening material which no doubt plays a big role on Vinyl Night Thursdays to help keep the echoes in check. 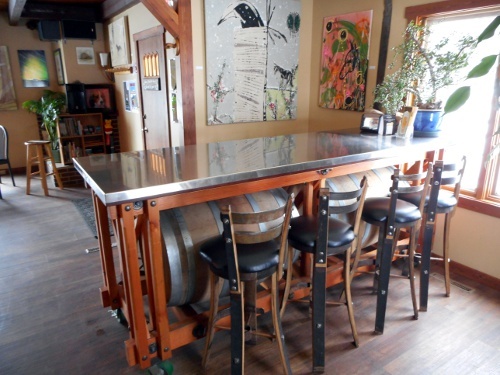 The seven barrel brewhouse also has a creative build to it. The vent hood for the brew kettle is an upside down farm stock tank that is suspended from the ceiling, the brew kettle and hot liquor tank were made out of wine tanks as was the wood clad mash tun which serves as the visual focal point of the room. The engineering of the plumbing between the mash tun, hot liquor tank and brew kettle is also something to marvel. The mash tun was designed for a four barrel system so Graham is really pushing the limits when he makes a seven barrel batch of his 7% ABV Due North IRA, but it is sort of his pride and joy and he does not have the heart to replace it. He realizes that anything you change also changes the process and the beer. March 13th of this year marked 2 years of operation for the brewery at its current location. It originally opened in the Whitefish Mountain Mall which proved to be a stepping stone to get the brewery to where it is located now, but from the start the current location was one of Graham’s top picks. Graham said that both times he setup the brewery it only took about six months to get it up and running and that his brewery was only down for about three months for the move. The lineup of main-stay beers has remained the same since the original location but the fifty to sixty different rotators change fairly frequently. Graham said that overall his most popular beer is his Little Blond Honey at 5.5%ABV and 15 IBUs. He did mention, however, that currently the best selling beer is a sour beer called Kinda Did. It is a sour blond ale brewed with wheat and has an ABV of 5.5% and 10 IBUs, but it is a rotator and will not last long. He has come to the realization that sour beers tend to be gateway beers for wine drinkers. When I asked Graham what was his main inspiration for new beers, he said it was usually the ingredients. He admitted that he sometimes will thumb through a catalog and buy a specially malt that looks interesting and then design a beer with it in mind. He also said that one of his favorite adjuncts to use is rhubarb. The finished beer is cloudy and tart like a wit beer which is caused by the pectin in the rhubarb. Graham agrees with Charlie Papazian, the author of The Complete Joy of Homebrewing, that anything that is edible can be put into beer, but he draws the line at a whole chicken. 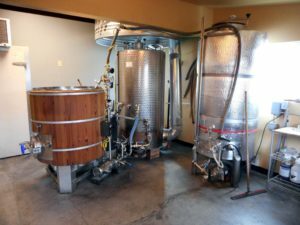 The customer base of Bonsai Brewing Project is a mixture of new and returning customers and they have seen a lot of growth over the years since they have been in business. They even have quite a few returning customers that live out of state and some even out of country such as from Calgary Canada. For those customers that cannot make it to the brewery when they are open, Bonsai Brewing Project does self distribute to six different bars to include one in Great Falls, Montana. I asked what the future holds for Bonsai Brewing Project and the answer was basically to keep doing what they are doing but to advance at it. Graham plans to make more sour beers and to do more barrel aging. He said the major advantage to barrel aging is that he can put away beer when demand is not as high, let it age, and then pull it out and serve it during his peak season. Aside from making really great beer, the barrels make great storage containers. Graham would also like to collaborate with different kitchens and farms in the future. I did the interview before they opened so I was too early to enjoy happy hour that runs during ski season from 3:00PM to 5:00PM, where you get a dollar off of each pint and free chips and salsa. However, I did stay for lunch, a pint, and to get my growler filled. Even though the food was served in a traditional pub style cardboard food tray, the presentation and attention to detail was like that of a fine restaurant. I especially enjoyed the substitution side of gumbo I ordered, but the pulled pork sandwich was excellent also. For my pint I chose the Kinda Did Sour Blond which was excellent and I can see why it is their best seller, and for my growler I tried something different. Normally I do not like wheat in my beer, but taking my own advice I tried something new that I did not think I would like. So with that, I tried their white IPA called The Hustle which is brewed with coriander and orange peel. At 6.6 ABV and 40 IBU the balance was good and the forward hop flavor was excellent. The citrusy hop aroma was so strong and wonderfully fragrant that when I rinsed the growler out after it was empty, it perfumed the area around my sink. It was wonderful. If you are in the Whitefish area or even if you are not, I highly recommend you visit Bonsai Brewing Project. You can find out more about them from their Facebook page: https://www.facebook.com/bonsaibrew/. I thoroughly enjoy their beer, food and atmosphere and I hope you do also.